The shamrock is undoubtedly the most identifiable symbol of Ireland. Shamrock comes from the Irish Gaelic word Seamrog, a word that refers to the plant's three leaves. 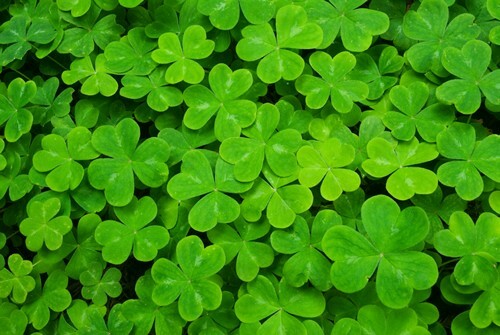 The shamrock as symbol of Ireland and St. Patrick's Day is partly due to the natural abundance of clover plants in the country, but largely due to its strong association with Christianity. Legend says that St. Patrick used the shamrock to visually illustrate the concept of the Trinity (the Father, the Son, and the Holy Spirit) when trying to convert polytheistic pagans to Christianity. In Christianity, God is three persons, but it's not the same as three gods. The simple analogy is thought to have helped non-Christians understand a fundamental element of the Christian religion. Whether or not this story is true, the shamrock is regarded as the national plant of Ireland and always worn on St. Patrick's Day. Fantastic way to teach children as a teacher I will use this for my second grade religious class.